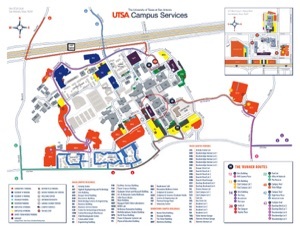 Curtis Vaughan Observatory (CVO) is located on the top floor of the Flawn Science Building (FLN), on the UTSA main campus. Click below for location and parking. Note: ALL of our outdoor events are dictated by weather conditions. Please check the local forecast before you come to an event. If in doubt whether we will be there, please check Facebook or e-mail the address below. We will make every attempt to provide a fast response. 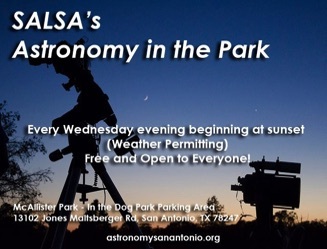 SALSA members serve as volunteers and docents at UTSA's Curtis Vaughan Obseratory, in support of two major programs: "First Friday Stargazing," and "Friday Nights, Celestial Lights." These take place during the school year, from Jan-May, and Sep-Dec.